Law enforcement continues searching for Alpha Sabbithi, 27, of Oak Lawn, Illinois after discovering his locked car at 4:00 A.M. Sunday morning. The vehicle was located near Maple Lake forest preserve, and his cell phone, car keys, and wallet was sitting on the seat inside. Alpha Sabbithi is described as being 5’11, 160 pounds, and having brown eyes with matching colored hair. When he was last seen, according to the alert, he was wearing a black T-shirt and brown cargo pants. His shirt reportedly had “Hollywood” written on the front in white letters. The division chief of the Oak Lawn police stated that the area would be further searched by one of his officers as well as officers from the Cook County Sheriff’s Department- the officers holding jurisdiction. The search was also aided by police searching the lake in boats while a police helicopter surveyed the surrounding area by air. According to the alert posted by Oak Lawn police, a bloodhound search dog was used from the Joliet police department; the dog was said to have caught Sabbithi’s scent at a boat launch at Saganashkee Slough, but Alpha was not there. 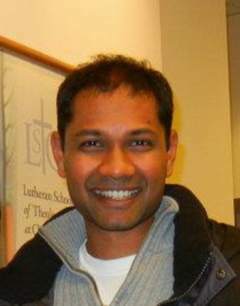 It is known that Sabbithi suffers from depression; however, his brother informed police of Alpha’s two week stay at a Michigan monastery recently, which he had learned of when seeing his brother for the last time on Saturday. His brother went on to say that Alpha seemed more relaxed and that “It was a personal thing for him”. If you have any possible information in regard to Sabbithi’s whereabouts, please contact the Oak Lawn Police at (708)-422-8292.